Output Interface: 10 way fan 12V 4pin interface port, support simultaneous starting of 10 channel 4-Pin fans, solving the problem of shortage of motherboard. The orange interface is the dedicated interface for CPU fan, and the other black interfaces are conventional PWM fan interface. PWM Interface: For connecting to CPU FAN interface, which support PWM function, on motherboard with connection cable. Function: Support PWM function fan automatic speed regulation. Installation: With EVA double-sided adhesive on the back, you can fix the hub in the chassis. 1. The fan is a 4-pin PWM fan, which is very important. Some motherboard 4-pin interfaces are not a real PWM fan jack, they are adjusted by the voltage. Such motherboards can not make PWM control fans. 2. Connect the motherboard 4-pin fan interface, BIOS starts the PWM function. Function: Support simultaneous starting of 10 channel 4PIN fans, solving the problem of shortage of motherboard. 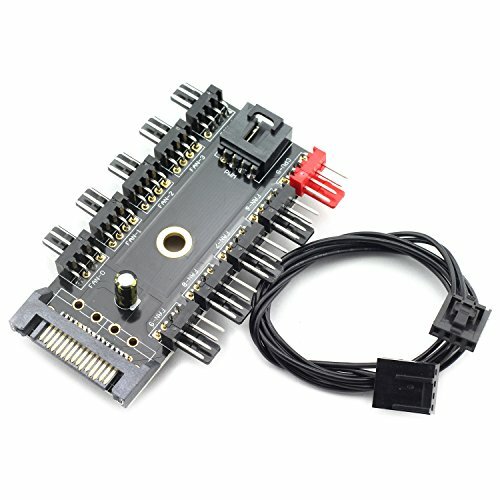 Interface: 1pcs SATA power interface, 1pcs PWM interface for connecting to CPU FAN interface on motherboard, 1pcs red delicated CPU fan interface, 9pcs black conventional PWM fan interface. Installation: EVA double-sided adhesive can be used to fix the hub in the chassis. If you have any questions about this product by ZRM&E, contact us by completing and submitting the form below. If you are looking for a specif part number, please include it with your message.